This exert below from a summary of a study by P Wagner DVM & Susn Kempson BScPhD. Primarily petroleum oil-based--These are usually "gooey" or tarry products. Ingredients might include neatsfoot and/ or cod liver oil, pine tar, petroleum compounds, and/or turpentine. Primarily lanolin-based--These are usually more the consistency of hand lotion. Ingredients might include lanolin, lactates, stearates, alcohols, and glycerin. Primarily containing a drying agent--Ingredients might include acetone. The question is, how well do they work? Hoof Permeability Sigafoos has used some hoof wall products principally to manage hairline cracks at the coronary band, a problem that is very common in Standardbreds. "I have had some success in using prescription dressings that contain antifungal agents and steroids to control fungal infections at the coronet," he says. Otherwise, he believes that hoof dressings are of "limited value" for acute or chronic hoof problems. Kempson has investigated the effects of hoof dressings on hoof wall by examining the permeability barrier in the hoof capsule and factors that influence it. "This work started in the mid-1990s and is ongoing," she reports. "Before I could look at the effect of hoof dressings on the horn, I had to investigate the permeability barrier in the horn." Just as there is a permeability barrier controlling passage of water and water-soluble materials into and out of the skin, so there is one in the hoof horn. To study this aspect of the hoof wall, Kempson used water-soluble tracers visible with both light microscopes and electron microscopes. "The tracers are small molecules that travel with the water into the horn," she explains. "If the water can get into the horn, then it could also get out! The water could either travel between the cells or through the horn cells, or a combination of both." She took full-thickness blocks of horn from dorsal walls, soles, and frogs of feet obtained post-mortem. She compared good-quality horn with poor-quality horn (i.e., horn with cracks). "In feet with good-quality horn, there was virtually no penetration of the tracers and water through the outer pigmented layer of the dorsal wall," Kempson found. "There was some penetration through the inner non-pigmented layer of the wall both through the intercellular spaces (between cells) and through the cells. This indicated differences in the permeability barrier between the inner and outer layers of the wall. In a normal hoof, the inner layer is not exposed to the environment and is therefore unlikely to lose or absorb water through this horn. There was more penetration of the tracer through the sole horn and even more through the frog horn, but this was still only limited to a few cell layers--five to eight cell layers in the sole, and 12-18 cell layers in the frog, which is less than one millimeter." Her findings regarding poor-quality horn were quite different. In these walls, the water and tracer penetrated deep into the pigmented layer and spread through the intercellular spaces and into the non-pigmented horn. As part of the study, Kempson also examined how environmental conditions could affect hoof wall integrity. "Having spent several years studying the effects of nutrition on the hoof capsule, it became clear that the environment was also having an influence on the integrity of the horn," she explains. Therefore, Kempson looked at the effects of feces, urine, hoof dressings, heat, cold, and water--the various elements to which horses' hooves could be exposed. For two weeks, blocks of wall, sole, and frog were either left in the test solutions, heated to 98.6°F (37°C), chilled to 39.2°F (4°C), or left in water. Afterward, they were exposed to the water-soluble tracers. "The results were surprising," Kempson says. "Heat, cold, and water had no effect on the permeability barrier. The sole and frog horn left in feces for two weeks disintegrated, and poor-quality wall horn was also badly affected. Good-quality wall horn was only marginally changed. Urine alone had little effect, but combining urine and feces had the same results as feces alone. "My conclusion is that the horn has a built-in permeability barrier," she says. "As long as the horse has a well-balanced diet so that he can produce good-quality horn, leave the hoof horn to look after itself." Hoof Dressing Research Formalin is extensively used as a biological fixative for routine histology, preservation of cadavers, etc. It can also be used as a disinfectant because it kills bacteria. When Kempson applied dressings containing formalin to the hoof samples, there was no change in the permeability barrier of either good or bad horn samples. "Formalin causes the horn to lose its plasticity, and it becomes brittle and more liable to crack," she states. "With horn of poor quality, the formalin-based dressings penetrated deeper into the horn than in the good quality feet. This meant that the micro cracks caused by the formalin extended farther into the tissue and this let water and other materials penetrate the horn. The damage caused by the formalin-based dressings was greatest in the sole." Poor-quality horn treated with formalin thus becomes more susceptible to infectious and toxic agents, and therefore this chemical is best avoided. 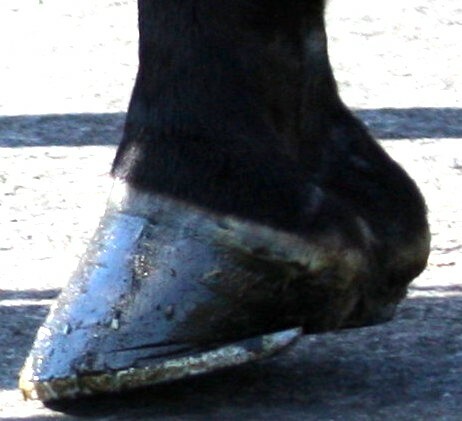 The study also showed that hoof dressings containing solvents and tar-based components damaged poor-quality horn. In some cases, the intercellular lipids or fats were damaged, allowing water contained within the horn to evaporate, thus causing the horn to become dry and brittle. In very wet conditions, using these hoof dressings allows water into the horn, and the feet become very soft and weak. "When these products were applied to poor-quality horn, the damage was magnified, and I could not get results from some of the tissues because they had disintegrated in the test solutions," she notes. Good-quality horn was affected in the same way, but it took longer for the effects to be seen. "It was also clear that the majority of the dressings that horse owners applied to the hoof capsule did much more harm than good. Most are unaware of what they are doing to their horse's feet. They apply the dressings with the best of intentions, but more research needs to be done to clarify the situation." Wagner participated in two separate hoof studies done at Texas A&M University. One in vitro (outside the body) study was to determine if hoof wall dressings could alter the hoof wall moisture content under controlled laboratory conditions. The second in vivo (in the living body) study looked at the ability of certain products to change the biomechanical ability of the hoof wall to withstand certain stresses. Previous research showed a relationship between relative hydration of the hoof wall and its mechanical properties. Wagner says, "If the wall suffers from dehydration or overhydration, it will become more susceptible to developing cracks and splits." Thus, Texas A&M University researchers sought to evaluate the relative efficacy of commercial hoof wall dressings in maintaining hoof wall hydration. Researchers took hoof wall samples from 10 clinically normal, sound horses within 24 hours after euthanasia (they weren't killed for this study). "We coated these samples with 15 different products, let them dry over 48 hours, and measured the samples at certain intervals," Wagner says. The products were either mainly oil-based, lanolin-based, or contained mostly acetone. "We did calculations to determine sample moisture content changes to see if these products could maintain the moisture content that was already there or increase it," he says. Data indicated that several products under ideal conditions could maintain hydration of the wall for 12 to 24 hours. Control samples without the dressing lost much more relative moisture. When the three groups were compared, those products maintaining the highest degree of relative hydration in the hoof wall at 24 hours were primarily the oil, pine tar, and petroleum-based products, says Wagner. "However, that's not necessarily a good thing because you can over-moisturize the wall and make the wall less strong than it was to begin with," he says. "Too much can be bad. I think there are situations in which it is apparent that the hoof wall is exceptionally dry, but that could have been an adaptation to the environment and not necessarily a bad condition for the hoof." Hoof wall achieves its maximal fracture toughness when relative hydration is maintained at approximately 70-75% moisture. However, studies are needed to evaluate the best hydration level. It's important to remember that environment will have a significant effect on hydration of the hoof. The researchers warned that results shouldn't be directly extrapolated to living horses, as normal horse movement can physically remove the dressing from the hoof wall, thus reducing its efficacy. "In addition, the internal environment of the horse's foot may contribute to maintenance of natural hoof wall moisture as well," Wagner notes. "Obviously, this was not a contributory factor in this study." The second study in which Wagner took part examined whether commercial hoof dressings could affect hoof wall strength in live horses. This study used three selected products applied to the feet of five horses for 13 weeks--a different product for three hooves with the remaining hoof used as a control. These horses lived in normal conditions, being exposed to rainy and dry weather conditions. For 13 weeks, lanolin-based and petroleum-based products were applied twice daily, while the acetone-based dressing was applied once a week (per label recommendation). "At the end of that period, we took strips of hoof wall samples to the engineering department to measure the strength of the hoof wall," he says. "A lot of products claim they can change the protein structure and strength of the hoof wall; none of them made any difference. They didn't show any kind of change in the elastic modulus (flexibility of the hoof wall)." However, the study notes that it's "still possible that these products are affecting the wall, but only to a certain degree. They may be influencing the outer hoof wall, which may not be evident in this study due to the use of full-thickness wall samples." In reflecting on the studies, Wagner says that hoof dressings "are often prescribed for conditions in which the hoof problem is more likely due to a genetic problem of poor hoof wall metabolism, growth, or matrix that simply cannot be changed."